Catholic Media is everywhere these days, but many people still aren't sure of where to find it or which ones to choose. Enter the brainchild of Greg Willits of The Catholics Next Door. 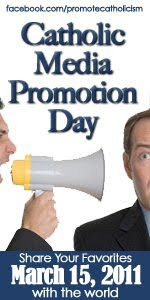 He has created Catholic Media Promotion Day to get the word out all the wonderful Catholic New Media out there. Shelly and I chose one favorite in each of the following categories to highlight for you. Favorite Blog or Website, Favorite Podcast, Favorite Book, Favorite Smartphone App, Favorite Catholic Media and a "Hidden Gem." After reading through our favorites, head over to the special FaceBook page for Catholic Media Promotion Day to find even more favorites and suggestions. Take a moment to write about your favorites on your own blog (if you have one), on FaceBook and leave a comment here sharing yours with us. Choosing only one blog or website to highlight on Catholic Media is difficult! From my friendships on Facebook and Twitter, I'm exposed to dozens of great blogs on a regular basis. Even though this may be repeated often, I'm going with SQPN.com , because it’s one of the best “go-to” sites for keeping up with what’s going on in the world of Catholic New Media. Father Roderick and the wonderful people responsible for content show us the fun side of being a Catholic. My introduction into the world of Catholic New Media began by listening to Catholic Under the Hood, which opened the door into a wide world of multiple Catholic podcasts available for any interest. I have many favorites, including the ever-exuberant Catholic Foodie, but in the last few weeks I’ve found myself listening to Catholic Family, enjoying their informal banter, parenting tips, and friendly conversation. Hands down my favorite Catholic book this year is Light of the World, the intimate conversation with Pope Benedict XVI by Peter Seewald. I found myself reading and re-reading every question, every answer, carefully considering the meaning of each sentence - meditating on the concepts, the context, and the truths of what The Holy Father shared about our Church. My favorite smartphone app is the SaintCast app introduced last summer that allows me to access the podcast at anytime, anywhere, without having to sync my iPod/iPhone with iTunes in advance. National Catholic Register for their variety of news and blogs. For news junkies, it’s a good place to get a Catholic perspective and editorials about what’s going on in the world around us, politically and socially. I never go anywhere without my RosaryCast – RosaryArmy audio Rosary and Scriptural Rosary. Like the SaintCast app, having my audio Rosary available at my fingertips. Whenever I find myself with an unexpected 20-30 minute wait or downtime, it’s so convenient to pull out my iPod and be still in prayer led by the comforting voices of Greg and Jennifer Willets. Thomas Peters, aka American Papist is a daily must read for me. Now over at CatholicVote.org, Thomas successfully writes about politics and government from a Catholic perspective. I love his belief in online Catholic activism and his willingness to stand up for our values and morals, even when it is unpopular. I have been listening to Catholic podcasts for 4 years and credit many of them with helping me become closer to my Catholic faith. If I must choose just one, it has to be “The Break with Father Roderick”. With his conversations about our Catholic faith, Star Wars, food, travel and every other random topic he has discussed over the years, Fr. Roderick engages the listener in a personal relationship that brings you back again and again. He makes me laugh, cry, smile and love God even more. I stumbled upon a book at a Christian bookstore 7 years ago that clarified the way I viewed my Catholic faith. Rediscovering Catholicism: Journeying toward our Spiritual North Star by Matthew Kelly opened my eyes to the spiritual side of Catholicism I was missing. This is a book I hand out to many of my Catholic friends who feel separated from the faith and Church. Reading it helped me reconnect with Catholicism at a time I was searching for more in my spiritual life. 3 Minute Retreat by Loyola Press. With a scripture reading, reflection and prayer, this lovely app provides the tools I need to have a personal prayer retreat at any moment of the day. OSV Newsweekly, a weekly newspaper that arrives in my mailbox, is full of articles and news relevant to our living out our faith. I must agree with my sister, Shelly, for Hidden Gem. My favorite has to be The Rosary Cast, free Rosary mp3’s by Rosary Army. For several years I have used their recordings as an aid when praying the rosary. Recently I have introduced my young children to these mp3’s when praying the rosary as a family or on their own. They are an aid to prayer for anyone longing to pray the rosary.